Sad, very sad. James Gandolfini is dead and we shall see no more of his wonderful acting talents. (I think it’s time to rewatch The Sopranos). This doesn’t distract too much from the fact that it’s a very beautiful film. To finish your career with a film like this says so much about the humanity he brought to his roles and is a testament to the big man’s sensibilities. If you ever read any of the eulogies or comments made by people who knew and worked with him you’ll have heard the constant references to the gentleness/kindness/loyalty attributed to this man. Here he gives a performance of charm, humour and warmth that is difficult to fake, no matter how good an actor you are. It seeps through the screen into your heart every time he’s on screen. Julia Louis-Dreyfus was also wonderful, quite ticky but nevertheless believable. 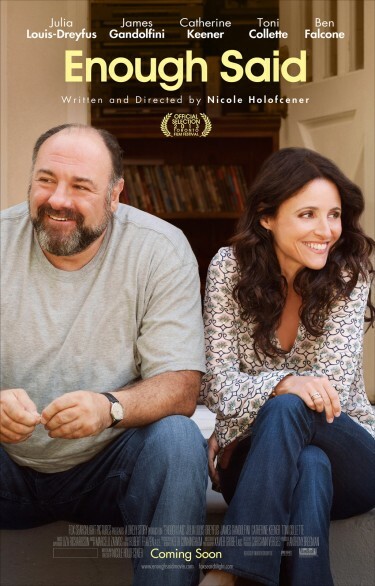 I have been loving her in Veep and I probably wouldn’t have seen this but for the mighty Gandolfini but I am glad I did. Her emotional journey was believable and sincere. If you’re a fan of either of the 2 leads definitely have a look. A small, intimate film about trying to find love in later years.